In what turned out, alas, to be my last regular column for the Globe’s ROB, I point out that unemployment statistics hide more than they reveal. What tell us a lot more are the data for the shae of the population in paid work or looking for work, know as the labour force participation rate. Focusing on this number tells you lots about politics, the state of the economy, and even some of the roots of Donald Trump’s presidential victory. You can read the unedited text below or online here. What do we know about the people who Donald Trump turned into such a potent political force in the last election? US unemployment is well below five percent; surely there was no objective basis for the economic insecurities that drove the “basket of deplorables” to vote for the Republican candidate. Consider, though, that one of the best places to seek insight is not the unemployment rate, but the “labour-force participation” or LFP. The LFP shows the share of working age people who have jobs or are actively seeking jobs in the US. In other words it is also a pretty good measure of how many people have left the workforce because they are discouraged and feel there are no opportunities for them. What do we know about them? Trump’s election coincides with the US LFP rate hitting its lowest level in more than 30 years. The state-by-state figures provide even more insight into Donald Trump’s political resonance. Nine out of 10 states with the lowest LFP rates voted for him. Of the five states that went from Blue to Red in 2016, three – Florida, Michigan and Ohio – experienced a drop in their participation rate relative to 2012, meaning a smaller share of people worked and were looking for work compared to four years earlier. The other two states had no increase in the share of people working despite several years of modest economic growth. By contrast, the years of Bill Clinton’s presidency coincided with a high LFP rate, a time when workers were prepared to give Bill “I feel your pain” Clinton the benefit of the doubt about how trade would improve Americans’ standard of living and those harmed would not be left behind. No more. That good will is gone. New research from the centre-right American Enterprise Institute think tank shows that millions of American men are jobless and have given up looking. The share of men 20 and older without paid work is nearly 32 percent. That bears repeating: basically a third of all men in America who are over 20 have no paid employment. Two economists at the centre-left Brookings Institution have now added that the LFP rate of prime-age women has stagnated and also declined. People collecting disability benefit has increased markedly. This doesn’t just affect their job prospects. Other research, including by a Nobel laureate, shows that the life expectancy and health of these displaced and discouraged workers has gone into a tailspin thanks largely to illnesses related to drug and alcohol abuse and other “lifestyle” factors. As one analyst said, these people are dying of despair, with over half a million needless deaths being attributed to bleak job prospects. So looking solely at the unemployment rate causes us to lose sight entirely of a major part of the population. This segment is not just constituted of men–and now increasingly women–left behind by economic change. It also includes their parents, friends, and colleagues, who see these people they care about left on the shelf and are angered that opportunities for them seem so few and far between. This starts to be a significant part of the population—and the electorate. It is no answer to say that these people have misdiagnosed their plight when they follow Trump in seeing trade and immigration as the cause of their problems. Yes, the problem is far more down to automation and other productivity-enhancements, meaning that manufacturing requires fewer and fewer poorly-educated, relatively low-skilled workers. Yes, Trump is wrong when he says that America doesn’t make things anymore and needs to return to this economic vocation. The truth is that America has never made more things than it does today. It just doesn’t require many workers to do so. But the fact that the diagnosis is incorrect misses the key point about Trump’s voters – they vote for him chiefly because they feel he is the only political leader who doesn’t simply dismiss their fears and anxieties as misguided and ill-informed and doesn’t tell them condescendingly that their problems will disappear if only they get a university degree or if the government institutes a guaranteed annual income and basically writes them off as contributing members of society. A pervasive feeling has taken hold in many parts of American society that ordinary people are being made to pay the price of the ideals of the elites. Free trade is one such ideal, one in which I happen to believe, but also one whose highly-concentrated destructive effects are undeniable and frequently easier to identify than its widely-dispersed benefits. That is why free trade can only be sustained when the winners use the extra wealth created to compensate the losers – something we, like the Americans, have done poorly and unimaginatively. According to Harvard’s Edward Glaeser, “Cities are the best path we know out of poverty.” This is echoed by prominent economist Paul Romer who has made the richly documented case that humanity’s urbanisation over the last 10,000 years has been the main driver of human progress. He argues that the present century is the one where the urbanisation trend finally reaches into every corner of the globe, and the world’s population will stabilise at 10-11 billion people, with 70-80 percent of them living in cities. But alas it is not sufficient to shepherd people in to growing urban areas for them to participate in the economic benefits of urbanisation. I was put in mind of this the other day when I read a piece by a journalist detailing the challenges he faced flying out of Kinshasa, the capital of Congo. Kinshasa is a city of some 12 million people and the third largest in Africa, so its challenges are emblematic of the obstacles to cities bringing widespread prosperity to that continent. When I lived in Kinshasa over 30 years ago, hardly anyone flew out of the local airport. When I left I took the African Queen-like ferry across the Congo River to Brazzaville whence you could connect to French international flight networks. Apparently it is slightly better now in Kin, as the locals call the city. Now there are 11 international flights a day. Still a paltry number for any self-respecting city of 12 million residents, for one of the ways cities create wealth for their inhabitants is through dense networks of connections with other cities. There are 1400 flights a day through Heathrow and 1100 through Pearson. And it is not just airline schedules. When I lived in Kinshasa almost no one had a telephone. Copper wire was so valuable that even if you could get a phone connection installed (in itself a minor miracle) the chances were that scavenging gangs would quickly rip out the connection. Making an international call was a hilarious undertaking. Since the country never paid its bills to the national telecom companies in other countries, international operators would never accept calls from Congo. You had to go down to the main telephone exchange and bribe an operator to start calling every country in the world until they came across an operator that hadn’t got the memo that calls from Congo were verboten. Mobile telephony has surely improved things, but not nearly enough. These tiny examples illuminate the larger principle about much African urbanisation, namely that unlike, say, China or Korea or even much of Latin America, Africa is urbanising without globalising; Africans are getting only a tiny part of the benefit that growing cities might confer on them. Fixing this will perhaps be the single most important thing that could be done to help pull Africa out of poverty and connect it with global opportunities. But that means focusing on the right problems and the right solutions. The biggest obstacle African cities face to realising their full potential is the weakness of the institutions on which they are based. Yes, people come to cities because there are more jobs, higher levels of specialisation and therefore higher wages, educational opportunities, infrastructure and other advantages. But mostly they come because successful cities have rules of behaviour that protect the investment that companies and individuals make to improve their business and their lives. If organised gangs can take what you have worked so hard to create, why invest in your education or your business? If the government can bulldoze your little shanty on a whim or ownership isn’t even available because slumlords backed by violence control vast slums, how can you build a stable life? If water, sewer and electricity hookups are a luxury available only to elites, how can you avoid epidemics or connect to the Internet? What makes cities in the West such magnets for people from all over the world is that property rights are clearly defined and enforced, when your safety and security is threatened you can call the police and they will come and they won’t extort you, if you sign a contract it will be enforced pretty even-handedly on the parties. We have created the certainty needed for investment to be made in the provision of services such as water, sewers, electricity and data pipes, not to mention education, transport and health care. Lagos, Kinshasa, Nairobi and other emerging African megacities show that the continent is getting the easy part right, with urban dwellers doubling every 20 years. But services and institutions are falling behind. Institution-building will determine whether those cities can realise the promise of prosperity too. 2017 is a big year for Canada. The country was founded 150 years ago in an act of supreme statesmanship. It is the 100th anniversary of the battle of Vimy Ridge, where we came of age in a sustained act of courage, heroism and determination. Governments in Canada are now claiming that their recently announced Canada Free Trade Agreement (CFTA) deserves to keep such exalted company and will come into force on July 1st, Canada’s 150th birthday. Does the CFTA deserve such hoopla? On the contrary. While it represents some modest incremental progress on creating a national market open to all Canadians on equal terms, this progress has much to be modest about. Moreover the sordid backroom horse-trading that gave rise to it, in which rent-seeking interests allied to various governments saw many of their unfair advantages maintained, was the very opposite of what the founders of Canada thought they were conferring on their posterity. Yes, it’s very nice that every field of economic activity is now covered by CFTA, as opposed to the old dispensation where only those fields specifically included were covered. But the price the provinces exacted for this was well over 100 pages of exemptions and exceptions to the principle of free trade within Canada. The really tough areas, such as liquor, financial services and regulatory harmonisation? Well they have promised to study those some more. Don’t try and sell milk or eggs or any other “supply-managed” product across provincial boundaries. The barriers that forced Newfoundland and Labrador to sell their electricity to Quebec at a fraction of its value remain and nowhere I can find do the premiers promise to give up their latest fad: claiming the right to veto pipelines that cross their territory. Alberta is already considering creating a Crown corporation to handle government construction projects to escape the opening of government procurement they just agreed to. Finally, on actually enforcing the rules of free trade our political leaders raised the monetary penalties for non-compliance. Again, very nice. But they’re hoping you won’t notice they have essentially maintained their Rube Goldberg mechanism in which the complaints of businesses and individuals about unfair actions or practices will be the subject of endless intergovernmental consultations and panels whose decisions will come long after the original business opportunity has died from neglect, starvation and exposure. God help you if you want to get the courts to intervene to make governments follow their own rules, because the governments have made it clear they don’t want those bolshie judges sticking their nose in the provinces’ business. The very purpose of Confederation, we often forget, was in large part about freeing Canadians to carry on their profession or business across provincial boundaries. As George Brown famously described the vision its authors had of Confederation: “the proposal now before us is to throw down all barriers between the provinces — to make a citizen of one, citizen of the whole.” Such freedom was explicitly to be a matter of shared national citizenship. Responsibility for achieving Brown’s vision was granted to the national government in a broader federalist arrangement. The essence of federalism is, after all, the creation of a unified national economic space while buttressing local identities, be they linguistic, cultural, ethnic or religious. Matters of nation-building or common interest – such as the functioning of the national economy – were thus to be entrusted to the newly-created national government rather than provincial or parochial interests. That’s why it got jurisdiction over peace, order and good government, trade and commerce and national infrastructure. That’s why there is a national open market clause (Section 121). But that’s not what happened with the CFTA. There the federal government continued the appalling tradition of its predecessors in neutering federal power in order to appease the provinces and territories. The result is not only another bad deal for Canadian businesses, workers, and consumers, it’s a disavowal of Confederation itself. The founders gave Ottawa responsibility for the national economy because they expected provincial governments to speak for provincial interests. That’s precisely what happened. Someone needed to speak for Canada. Instead the silence was deafening. The sheer number of CFTA exceptions is a by-product of how ill-suited the provinces and territories are to protect and strengthen the economic union. Provincial and territorial ministers naturally care more about the interests of Ontario wineries, Quebec funeral directors, Nova Scotia fur harvesters and PEI architects than about the national interest. 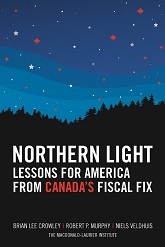 The CFTA is not evidence, as its authors claimed, that “Canada works.” On the contrary, it is eloquent evidence of Ottawa’s unwillingness to face down the provinces when the national interest requires it. Ottawa exists for a reason; that reason is not, as one former prime minister tartly observed, to be headwaiter to the provinces. Writing in my fortnightly Globe column I make the case that commentators can harrumph all they want at Kevin O’Leary’s plan to discipline the provinces for damaging Canada’s national economic prospects. He is doing nothing the founders of Canada didn’t plan and allow for. His rhetoric may be a little over the top, but he is not wrong to say that Ottawa has the tools to discipline provinces who act contrary to the national interest (including via withholding some transfers) and that they should be used when circumstances warrant. As I wrote in my Globe column for the ROB, carbon taxes are all the rage, but they are not going to be the tax reform that will bring national tax systems into the 21st century. Governments and their traditional tax systems have become the latest bystanders sideswiped by the globalisation juggernaut, and the shift from corporate taxes to more objective tax bases like sales and consumption are going to be the response. In this context, people should stop ventilating and look more closely at the Republicans’ border adjustment tax. In my estimation it is a back-door way of introducing something like a much needed national sales tax in the US. In the lead-up to the federal budget, Ottawa was desperately signalling its commitment to fostering innovation in Canada. As the bard might have said, indeed did say, how weary, stale, flat and unprofitable. As I remind people in my Globe column for the ROB, there is nothing magic or special about innovation as an economic activity. Like all such activities, we make ourselves better off when we specialise in those we do well and let others do the same. In areas where we possess comparative advantage, we innovate just fine. In the others, why this mania to innovate at home as opposed to just doing what everybody else does: free ride on their innovations? After all we are one of the world’s wealthiest economies and the obsession with our “poor” innovation performance has for decades gone hand in glove with rising prosperity. In my Globe column I argue that the share of national income going to workers is being squeezed in Canada and other G20 countries. An excessive concentration of market share in the hands of fewer and fewer companies – not greed or offshoring – may be one of the most important trends responsible for this change. Will robots steal the last job? In the era of Donald Trump it has become commonplace to bemoan the disappearance of work and the fear seems widespread that robotics will replace virtually every kind of work. We won’t even drive ourselves anymore for Heaven’s sake! Machines will do it all. Or will they? It is a common fallacy that there is a fixed amount of work to be done and if machines do more of it there will be ever less of it left over for humans to do. But it is a fallacy no matter how hard some people believe it. The reason is that what creates jobs is human needs and desires and these are infinite. Moreover as we become wealthier (which automation allows us to do with no extra effort on the part of humans), we begin to think about satisfying those wants and desires that we had to set aside when we were too poor to afford them. There is a reason why it is wealthy societies, not poor ones, that go to the moon and the stars…. Read more in what has been my most commented-on Globe column of 2017. OK, it was also my only one in 2017 (published 6th January) so far anyway. Just checking to see if you were reading closely!